Nothing compares to the noise that Deshapriya Park was generating — an entire cement protima, and huge to boot, the goddess 88 feet tall. The pathways were dark except for the spotlights coming from the grass. There was a trickle of people following the trails looking this way and that. In that half dark, half light the air seemed to throb with suspense. We were looking for the Big One, the giant of them all and as the path curved, I saw it, covered in yellow veils up to the tiara tips. Music throbbed on the giant speakers and for a moment I wondered whether the veils would drop in one orchestrated sweep and the Big One would break loose thundering across the grass towards the crowds like a Kolkata version of Jurassic Park with delighted shouts turning into screams followed by the inevitable stampede. I was told the inauguration was imminent and knowing it was a Trinamool backed puja decided not to wait for the crowds that would sweep in with the VVIPs as the yellow veils descended. 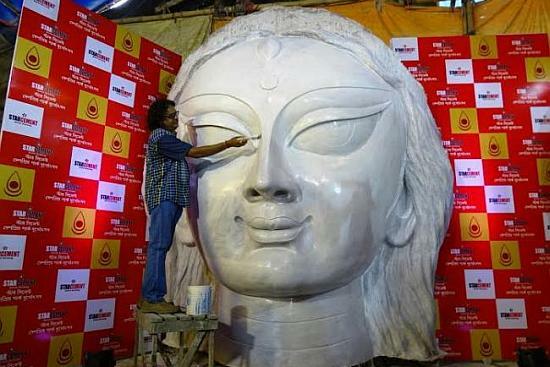 Perhaps it was prophetic — Deshapriya Park was hosting what had been touted as the world's biggest Durga image, the concept of Star Cement. Red and white banners had boasted the brand promise for months and a few other puja committees had shouted back with promises of the world's biggest flower, or comments like 'does size really matter'? Added to this was the State's determination to promote Durga Puja in Kolkata as the biggest thing since Rio De Janeiro — possibly even bigger. 42 observers had been invited from round the world, photographers, and travel writers. The roads had been caged in a snarl of bamboo, making them narrower and traffic jams had started piling up days before as alleyways and short cuts became off limits. Three portable toilets like kiosks, two for men and one for women appeared at a crossing near a minor pandal. Whether they functioned or not or whether they stank to high heaven, it was an effort of some kind, possibly a fall out from the original London yatra which had already donated a fountain and a Big Ben to the cityscape. But that was nothing compared to the noise that Deshapriya Park was generating. An entire cement protima, and huge to boot — the goddess was 88 feet tall, twice the height set by the high court for pandals. As a public relations effort it had the brand's name in front of all the crowds who were busy shopping for their puja wardrobes, linking it with bread and circuses. Naysayers were told that it was not entirely cement, that the structure was actually fibre encased in cement and that each part was being assembled separately, so it would not be quite as bad for the environment as anticipated. But those were only whispers. The other issue was infrastructure, the hoards that would invade the city in search of light and entertainment and a kind of art they could wonder at with awe. Looking down from my verandah at the stretch of Gariahat-Rashbehari below, I thought, stop the taxis and buses and autos and bring in a hop on hop off tram to take people from one end to the other. Though of course people would snake down the road in any case with squeakers and crackers and snarl the road from end to end. And as for trams they were a doomed species since no one had figured out a way to make them profitable barring selling the depot land. Deshapriya Park opened unsure whether the puja would have police clearance or not, but that was a done deal because of the backing it had. What no one had predicted was the tsunami that the Big One would unleash — even though there were uneasy mutterings and a woman claimed to have been molested by one of organisers when she raised a safety issue. Jurassic Park it certainly was in terms of blockbuster entertainment. For now the yellow veils have been lowered and the lights dimmed until someone pulls government strings and raises them again. After all, the great autumn show must go on.